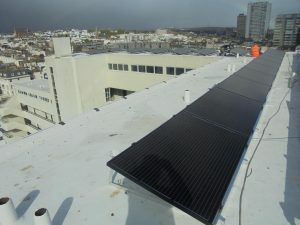 On the 26th March Embassy Court completed the installation of a roof top, photovoltaic solar panel array. The system comprising of 33 panels, generating 10kwh of energy, was installed by Aniron Renewables. Over a period of 20 years of the Feed in Tariff the return on investment will total an income of around £34,000. In addition we will be doing our bit for the environment by offsetting 116 tonnes of Co2 over the same period. The panels are from Solarworld, a quality German manufacturer with a class leading warranty of 20 years. Every panel is connected to a software programme where individual panels can be monitored for any drop in output or efficiency.